Eastern senior Asia Michael hands off to sophomore Taylor Parker in the 4x800m relay at The Ohio State University on Friday. Southern junior Jaylen Blanks runs down the homestretch of the 200m dash on Friday at Jesse Owens Memorial Stadium. Gallia Academy sophomore Madi Oiler clears the final hurdle in the 300m hurdles prelim, on Friday at Jesse Owens Memorial Stadium. 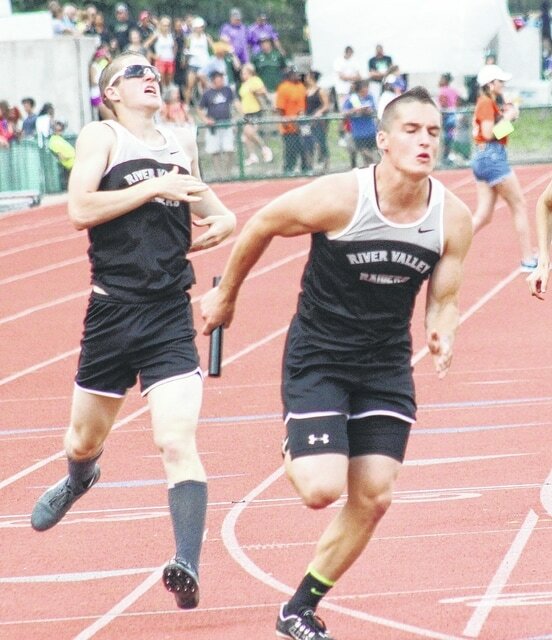 River Valley’s Mark Wray takes the handoff from Ethan Hersman in the 4x400m relay at the OHSAA Division II State Championships, on Friday in Columbus.